I had to move on to finding inspirations to start building up a meaning or what I am going to portray. I took advice to take some photos to document the physical structure of my room, such as the size of my bed, where everything is located, where I out my essentials and how I personalised my room. To me my room was comfortable and very personalised like my own den. 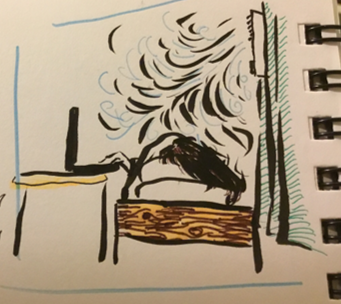 Other than that, I sketched patterns and try to place myself into the sketches of my room to try to convey how I felt as I am in my room in my natural habitat. I realised that I often use an energy-like flow to represent my room’s atmosphere. I did not know at the time, but I will be crucial to my findings. Shortly after, I tried to list the things I am drawn to in my room, something that is special to me. One of them is my air conditioner. I never turn it off since I need it cool my room down so that I can dive in my duvet all year round. Second would be my blanket, which instinctively serves as a barrier to me. I did not know the reason why at the time, but I was positive it was something about security and guarding my own territory. Since I only cry in my room, I felt like it was the only place I could cry in. I can only be totally vulnerable in my room. Still, I did not know why.